This cape is made of handmade wool felt with cotton canvas applique and leather fittings. 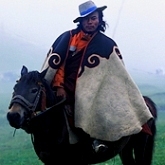 It covers fully on horseback for long rainy rides. One-size fits all.